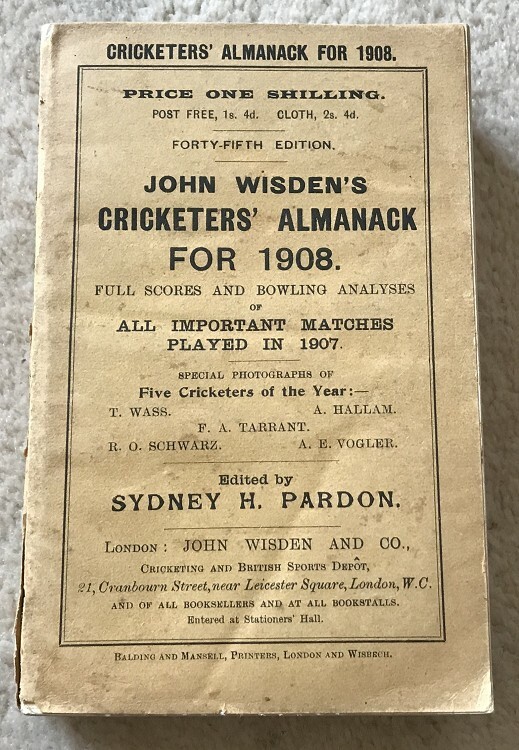 This lot is an Original 1908 Wisden Paperback. This lot is in very good condition. This book is very nice, only two things to point out and that is on the top side of the spine block a line is forming, I have tried to show it with me pulling at it on the picture and as you can see it is not substantial but needs some explanation, there is also a tiny ruffle of spine paper adjacent to the front cover, otherwise it is very nice indeed , super inside with a great photoplate. Tightly bound. Postage: £9.00 which covers Special Delivery & Jiffy Bag.